i have just done the first 2600 review on my channel and it will be the first of many to come as i've not done any games on this great system yet and there are some really great ones to cover ! if anyone has any requests then please let me know, i'm looking for strange and interesting homebrews and other such things ! Your embedded video isn't working, "Playback on other websites has been disabled by the video owner." you can watch it on youtube, mate ! Bloody hell you guys are lazy. Just click the YT link! @FunkySpectrum: Your commentary was bloody priceless. I was rolling with that bit about the Queen's throne and poetry recitals! Halo 2600 is a fun game. My best friend is a Halo fan and thought I was an idiot for buying it though. Never finished it due to the three lives not being enough later on when the enemies start dogpiling on you. 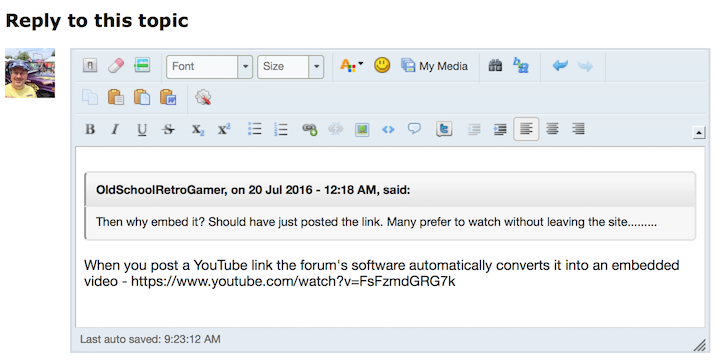 The way around it would be like this, but with just 13 posts I wouldn't expect Funkyspectrum to be that familiar with the forum software. OK fair enough.....................still should have embedding enabled to watch here though imho, seeing a thumbnail that cannot be clicked on and played where it is embedded has always bugged me. Edited by OldSchoolRetroGamer, Wed Jul 20, 2016 11:24 AM. Ironically when I use the mobile version of the site on my 3DS, it reformats the video as a link instead of embed. I'm trying to figure out how to type the embed tags so that doesn't happen. One click, and it opens in a new tab. If the OP wants to make people watch it on youtube, so be it. I found his stream-of-consciousness style commentary absolutely hilarious so you are really missing out on some comedy gold if you refused to watch over something as simple as clicking the link in the embed window. Edited by OldSchoolRetroGamer, Wed Jul 20, 2016 5:03 PM. See I found the commentary the opposite. It's just so random though. I couldn't help but LOL! for people with a more abstract and hard working sense of humour i like to think there's something worthwhile ! i don't script anything and just put in the game and do the commentaries live with no plan whatsoever i find it most enjoyable to make my videos that way ! some like them, some don't, you can't please everyone ! Good review man, I absolutely love this game. It was one of the first homebrew I got! thanks mate yes i love the game too it's a really good one ! really captures the halo feel i think it may even be better than halo 1 ! i've got quite a few more vids up since you posted this, mate, i usually post a video at least every couple of days ! I am at the moment doing a playthrough of THE REALM OF NO (an atari adventure game) in which the viewers choose the outcome, go over to my channel and have a look at those videos ! I've also reviewed a few atari 2600 games since the HALO review, too. It's all on my channel ! Enjoy !